140 x 42 cm 149000 Ft Raktáron! 132 x 40 cm 149000 Ft Egyeztetés szükséges! 136 x 41 cm 149000 Ft Raktáron! 144 x 43 cm 149000 Ft Egyeztetés szükséges! 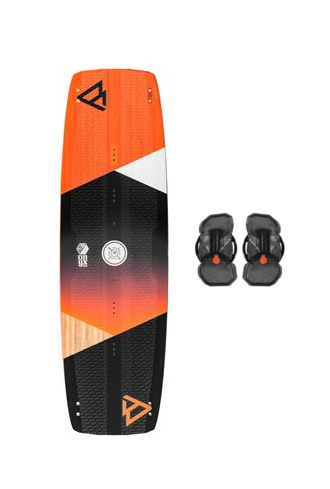 The Onyx is our accessible freeride kiteboard with a fine flex that feels at home in all circumstances. The kiteboard has been given a wooden core that ensures the perfect balance between flex and pop. This gives the Onyx a wonderful comfort while riding, but you can still enjoy a nice jump or trick. It has SR-Tech sides and a responsive flex, which makes it easy and effortless to cut through chop. To top it off, it has a single concave in the bottom, which ensures that you can plan super fast. Even if it is slightly less windy, the board stays on speed. The hyperbolic chassis is moulded in one piece, which gives your board a better torsion flex. Apart from that the hyperbolic outline provides a smooth and comfortable ride. The high tech W-Cores are precise engineered pieces of computer cut woodwork. Constructed to match the exact characteristics our riders wanted. Light weighted, thick enough to create stiffness and strength, and thin enough to allow flex and comfort. (Active Diamond Rail) Our ADR-tech is our no-compromise solution when it comes to freeride/freestyle. It provides a superlative grip due to the sharp rail, which also results in exceptional upwind performance. Kapcsolódó linkek "Onyx 2019 + Kötés"
Vásárlói értékelés "Onyx 2019 + Kötés"